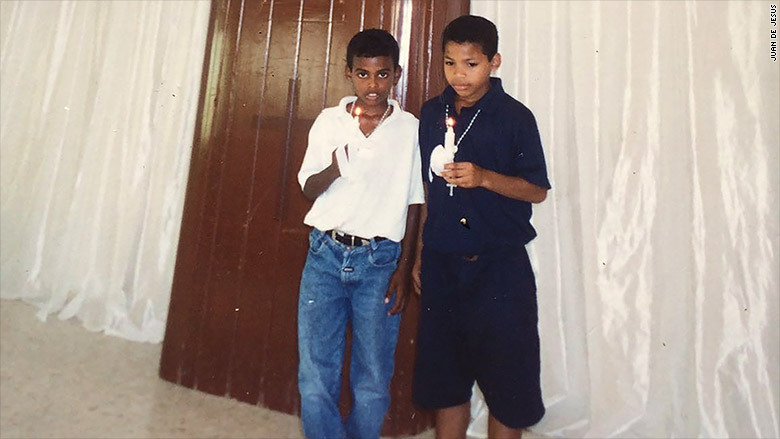 A 99-cent chessboard helped change the course of Juan De Jesus' life. If his little brother hadn't brought that board home and he hadn't become obsessed with the game, he may just have failed out of high school and he certainly wouldn't have gone on to attain a master's degree in education. "I was going through difficult times in school. I was getting into fights," says De Jesus, now a special education teacher at Health Opportunities High School, the same South Bronx high school he attended. De Jesus was born in the Bronx. When he was in second grade, his mother sent he and his brother Samuel to live with their grandparents in the Dominican Republic for three years while she saved up some money in Puerto Rico. While there, neither he nor his brother attended school -- missing crucial years of education. The family eventually reunited in Puerto Rico for one year and then soon returned to New York. Back in the Bronx, De Jesus was enrolled in the sixth grade, unable to speak, read or write in English. Juan De Jesus is a special education teacher at the same South Bronx high school he attended. For years, he struggled to keep up in school and eventually lost interest. The only thing he wanted to do was play chess. But that all changed when Jon Roure, an advisor from the CollegeBound Initiative, walked into De Jesus' English class. Roure took an interest in the chess loving teen and became his mentor. Soon De Jesus was hitting the books and competing on his high school's chess team. He eventually applied for and got into Skidmore College and qualified for New York state's Higher Education Opportunity Program, which helped him pay for school. In 2014, he earned his master's in special education from The City College of New York through the New York City teaching fellows. 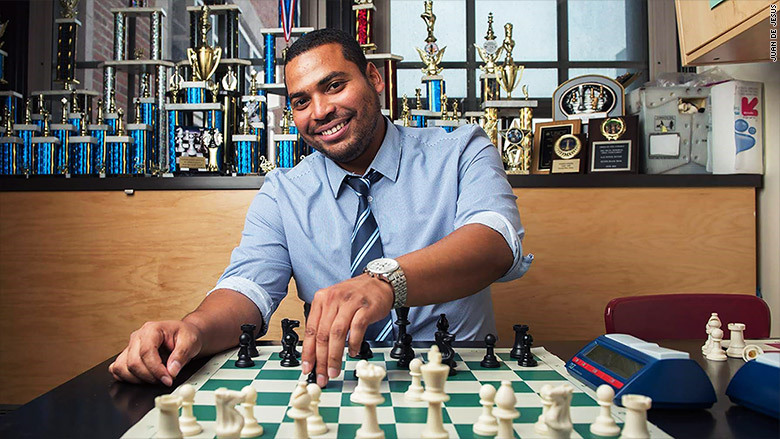 Now 29, De Jesus works for the New York City public school system and has started a chess program at his former high school, where he gives low-income kids a similar chance to succeed. He was recently given the Robin Hood Foundation's Heroes Award, an honor awarded annually to New Yorkers who have overcome seemingly insurmountable obstacles. This is De Jesus' American Success Story. 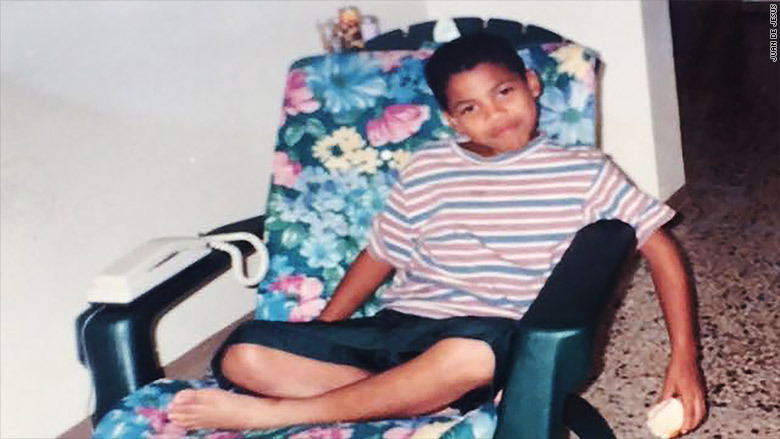 Juan De Jesus as a child in Puerto Rico. My mom left the Dominican Republic to come to the U.S. in 1985. That's when she met my father. But things were very difficult because he was an abusive alcoholic. Eventually, she met someone who took her in and helped her get on her feet. She remarried when I was in the first grade. Her new husband was Puerto Rican. They couldn't afford to bring us with them to Puerto Rico so she sent us to the Dominican Republic to live with my grandparents. My grandfather was a farmer in the Dominican Republic and I'd go with him to the rice fields, but I didn't attend school. [After three years, my brother and I] moved to Puerto Rico with my mother and stepfather and I went into the fifth grade there. It became immediately obvious that I didn't know how to read or write. I was ashamed and humiliated. I remember telling my mom and she sat me down on her lap and taught me the ABC's and how to read and write. There was a lot of cultural tension between Dominicans and Puerto Ricans. [The Puerto Ricans] called us "los monos," the monkeys of Santo Domingo. I didn't comprehend the racism. Then my mom was attacked and we decided to move back to the U.S. Right before we moved, I found out that my father had passed away. How did you fit into American life? I didn't know English. I was in the sixth grade and I didn't understand anything. I got really upset with my mother because I found out that there were classes in Spanish, but I was put in classes taught just in English. My brother and I spent most of our free time at home. One day, he discovered a 99-cent store. It was the most amazing thing in the world to us! He bought himself a cardboard chess set. He read the instructions and moved the pieces and taught me how to play. Clearly, we didn't learn correctly because the directions were in English, but it was something to do and we became obsessed. De Jesus (far right) eventually became a chess champion. Chess became my first language. It was my first chance to be connected with the world and be accepted and motivated to do something with my life. 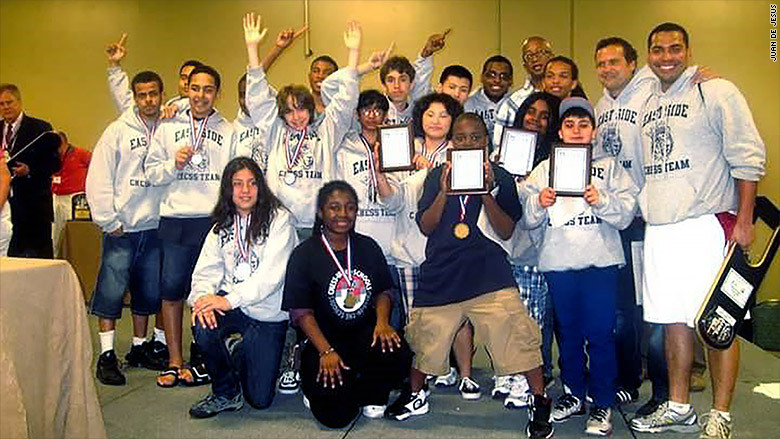 We began to compete in tournaments hosted by Chess in the Schools. I thought no one was going to beat me, but I lost every game for a year. Every loss motivated me to work harder. In high school, I played chess relentlessly. One day it just clicked. I was just winning. I loved that feeling. But I was still doing very poorly in school. 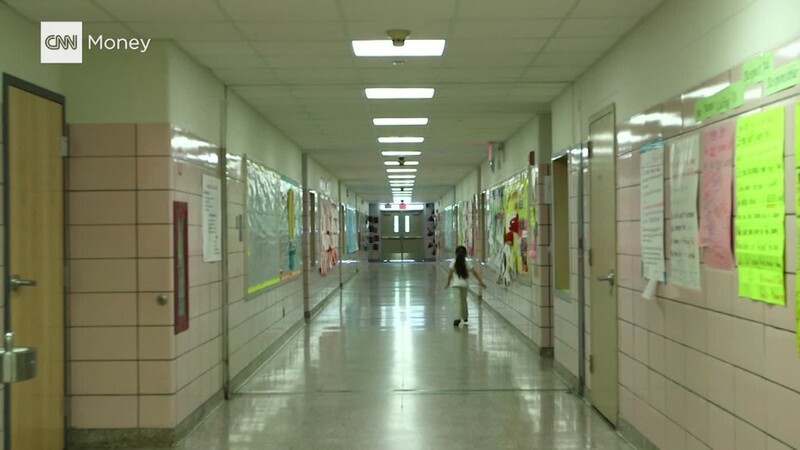 What turned your attitude around about school? There was a man who came into my freshman English class. When he spoke he sounded so educated and eloquent. He told me, "I'm Jon Roure, and I'm your CollegeBound adviser. Is college something that you want?" I told him I just wanted to play chess. He told me that I could play in college, but if I wanted to go anywhere in life I'd need an education. We became good friends. He was Puerto Rican and helped shed some light on the experiences I'd gone through. De Jesus (right) and his younger brother Samuel. He would organize college tours. It was cool, but I wasn't feeling any of it until we visited Skidmore College. I could totally see myself living there. From then on, the drive I had for chess went toward academics. [After I applied,] I waited for that envelope from Skidmore. One day my mom says, "Juan, the big folder is here." I read the first word: "Congratulations" and I started jumping on my bed like a madman. All mom cared about were the numbers. I said, "Mom, [it costs] nearly $55,000 a year." She started crying: "I make $15,000 a year." I told her, "Mom, you do understand that I have a scholarship?" And she started jumping on the bed harder than me! My brother followed in my footsteps to Skidmore as well. Why did you choose to go back to the Bronx and work with kids? When I graduated from high school I made a promise, "I'm leaving the Bronx and I'm never coming back." I felt this tremendous feeling of triumph. I was going forward and I didn't want to look back. But when I graduated from Skidmore, I was so grateful for all the help that I'd received from my friends and my professors and Jon, who I was still very close to. And so as I walked across that stage, the first man to have a degree in my family, I thought, "I can't live with myself if I don't go back and do the same for others as others did for me." Is there one person who has helped you the most? My mom is my hero. She was brave enough to leave her children to make a better world for her family. She's where I get my fighting instinct and motivation to be a better person. 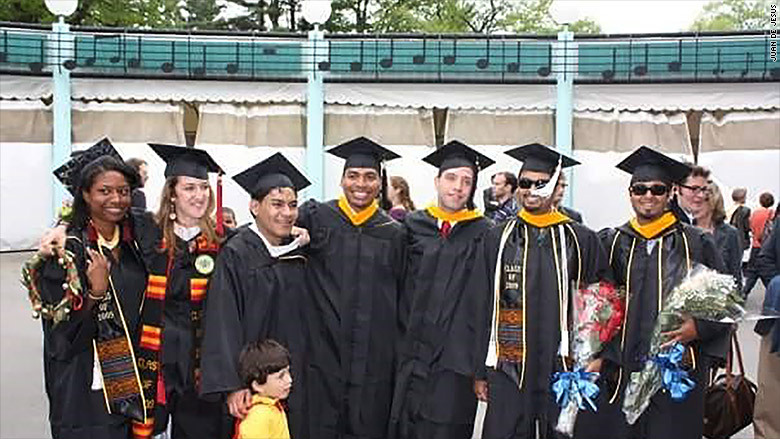 De Jesus (center) graduating from Skidmore College. Why do you think Robin Hood Foundation chose you as one of its Heroes and do you think you deserve the title? My first question was: "What does that mean?" I feel like I deserve a lot of things, but to be a hero? I'm an educator, I'm a teacher. A hero is someone who has a huge positive impact where they are. I'm not one to say if I'm a hero. Ask my students if I'm a hero and that will be your answer. The number one thing is calling or texting my students. They're what keeps me sharp. It's easy to get lost in personal success. But when I see them every day it's a reality check. Success is what do you do every single day to make this world a better place.